Propane R290 is a versatile green refrigerant with a Global Warming Potential of only '3'. Propane has an operational envelopment suitable for medium-low temperature refrigeration to traditional air conditioning applications, which presents R290 as a good environmentally friendly alterative to R404a in many low temperature applications. 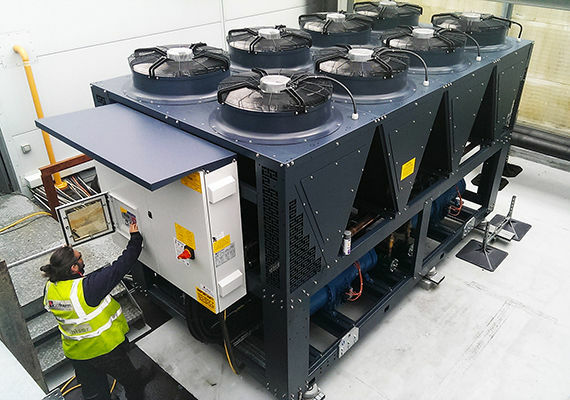 Cooltherm and Geoclima have been providing R290 chillers for over a decade, with a proven track record for reliability and performance. R290 is a flammable refrigerant but when applied correctly using the latest technology and leak detection systems poses no more risk than a conventional refrigerant, but at a fraction of the GWP. CoolTherm with CIBSE have developed a CPD module on the safe use of Propane (R290) in chillers, to review this CPD module please click here. We have full ranges of Propane (R290) chillers for the following applications. What are your compressor choices? With reciprocating being applied to small capacities and screw and inverter screw compressors being applied to capacity’s from 70kW up to 2mW.